This article is about the film. For the video game, see Rise of the Guardians: The Video Game. Rise of the Guardians is a 2012 American 3D computer-animated action fantasy film based on William Joyce's The Guardians of Childhood book series and The Man in the Moon short film by Joyce and Reel FX Creative Studios. Peter Ramsey directed the film, while Joyce and Guillermo del Toro were executive producers with voice acting by Chris Pine, Alec Baldwin, Hugh Jackman, Isla Fisher, and Jude Law. Produced by DreamWorks Animation and distributed by Paramount Pictures,1 it was released on November 21, 2012. Despite grossing $306 million against its $145 million budget, it was a box office bomb, due to production and marketing costs, losing DreamWorks Animation $83 million. Set about 300 years after the book series, the film tells a story about Guardians Santa Claus, the Tooth Fairy, the Easter Bunny, and the Sandman, who enlist Jack Frost to stop Pitch Black from engulfing the world in darkness. The film was nominated for the Golden Globe Award for Best Animated Feature Film. This was the last DreamWorks Animation film to be distributed by Paramount Pictures. Jack Frost awakens from a frozen pond with amnesia. Upon realizing no one can see or hear him, he disappears. Three hundred years later, Jack, as the young Spirit of Winter, enjoys delivering snow days to school kids, but resents that they do not believe in him. At the North Pole, the Man in the Moon warns Nicholas St. North that Pitch Black is threatening the children of the world with his nightmares. He calls E. Aster Bunnymund, Sandy, and Tooth, to arms. They are then told that Jack Frost has been chosen to be a new Guardian, and has him brought to the North Pole by Bunnymund. North explains to Jack that every Guardian has a centre - something they are the Guardian of, but a call for help from Tooth's fairies ends the conversation. Visiting Tooth's world, Jack learns that each and every baby tooth contains childhood memories of the children who lost it, Jack's teeth included. However, Pitch raids Tooth's home, kidnapping all of her subordinate tooth fairies except Baby Tooth and stealing all the teeth, thus preventing Tooth from sharing Jack's memories and weakening children's belief in Tooth. In order to thwart Pitch's plan, the group decides to collect children's teeth. During their journey, a quarrel between North and Bunnymund awakens a boy, Jamie. Since he still believes, he can see everybody except for Jack. Pitch's nightmares then attack, provoking Sandy as the Guardian of Dreams. Jack tries to intervene, but Sandy is overwhelmed and killed by Pitch. As Easter approaches, the dejected Guardians gather in Bunnymund's home. With the unexpected aid of Jamie's little sister, Sophie, they begin the process of painting eggs for Easter. After Jack takes Sophie home, he is lured to Pitch's lair by a voice. Pitch taunts him with his memories and fear of non-belief, distracting him long enough for Pitch to destroy the eggs, causing children to stop believing in Easter and Bunnymund. Losing his trust in the Guardians, a shamed Jack isolates himself in Antarctica, where Pitch tries to convince him to join his side. When Jack refuses, Pitch threatens to kill Baby Tooth unless Jack gives him his staff, the source of his magic. He agrees, but Pitch breaks Jack's staff and throws him down a chasm. Unlocking his memories, he learns that he was a mortal teenager who fell into the frozen pond while saving his younger sister. Inspired, Jack repairs his staff and returns to the lair to rescue the kidnapped baby fairies. Due to Pitch, every child in the world except Jamie disbelieves, drastically weakening the Guardians. Finding Jamie's belief wavering, Jack makes it snow in his room, renewing Jamie's belief and letting him see Jack. Jack and Jamie gather the boy's friends, whose renewed belief bolsters their fight against Pitch. Pitch threatens them, but their dreams prove stronger than his nightmares, resulting in Sandy's resurrection. Defeated and disbelieved in, Pitch tries to retreat, but his nightmares, sensing his own fears, turn on him and trap him in his lair. Afterward, Jamie and his friends bid goodbye to the Guardians as Jack accepts his place as the Guardian of Fun. Chris Pine as Jack Frost, the spirit of winter. Jack Frost is a teenage hellion who enjoys creating mischief and has no interest in being bound by rules or obligations; he just wants to use his staff to spread his winter magic for the sake of fun, but also wants to be believed in. At the end of the film, Jack became the Guardian of Fun. While he cannot fly, per se, he can be carried on currents of wind, allowing him to span great distances. Jude Law as Pitch Black (the Boogeyman), the essence of fear and the Nightmare King. Alec Baldwin as Nicholas St. North (Santa Claus), the leader of the guardians, and the Guardian of Wonder. He lives at the North Pole in the Ice Castle and is served by loyal North Pole natives, the Yetis (who built the castle and workshop) and the Christmas Elves. He carries a Russian accent/culture persona. Hugh Jackman as E. Aster Bunnymund (the Easter Bunny), the fabled keeper and bringer of Easter eggs and the Guardian of Hope. He has an Australian accent. Isla Fisher as Tooth (the Tooth Fairy), the mythical tooth collector and the Guardian of Memories. Tooth is part human and part hummingbird. Assisted by mini fairies that are split-off extensions of herself, she collects the children's teeth, which hold their most precious memories. Tooth stores them in her palace and returns memories when they are needed the most. Sandy (the Sandman), the Guardian of Dreams is the oldest of the Guardians and the first Guardian chosen by the Man in the Moon. He does not speak, but communicates through sand images that he conjures above his head. Dakota Goyo as Jamie Bennett, a child who has not given up on believing in the Guardians. In 2005, William Joyce and Reel FX launched a joint venture, Aimesworth Amusements, to produce CG-animated feature films, one of which was set to be The Guardians of Childhood, based on Joyce's idea. The film was not realized, but they did create a short animated film, The Man in the Moon, directed by Joyce, which introduced the Guardians idea, and served as an inspiration for the film. Early in 2008, Joyce sold the film rights to DreamWorks Animation, after the studio assured him it would respect his vision for the characters and that he would be involved with the creative process. In November 2009, it was revealed that DreamWorks had hired Peter Ramsey to make his feature debut as director of what was then titled The Guardians, and playwright David Lindsay-Abaire to script. Joyce acted as a co-director for the first few years, but left this position after the death of his daughter Mary Katherine, who died of a brain tumor. Joyce continued to assist as an executive producer, while Ramsey took over full directing, making him the first African American to direct a big-budget CG animated film. As with some previous DreamWorks films, Guillermo del Toro came on board as an executive producer. Present almost from the beginning, he was able to help shape the story, character design, theme and structure of the film. He said he was proud that the filmmakers were making parts of the film "dark and moody and poetic," and expressed hope this might "set a different tone for family movies, for entertainment movies." The final title, Rise of the Guardians was announced in early 2011, along with the first cast. Roger Deakins, the cinematographer who had already worked on the previous DreamWorks' film, How to Train Your Dragon, advised on the lighting to achieve its real look. He selected photographic references for color keys, and during the production gave notes on contrast, saturation, depth of field and light intensity. The film contains a lot of special effects, particularly the volumetric particles for depicting Sandman and Pitch. For this, DreamWorks Animation developed OpenVDB, a more efficient tool and format for manipulating and storing volume data, like smoke and other amorphous materials. OpenVDB had been already used on Puss in Boots and Madagascar 3: Europe's Most Wanted, and was released in August 2012 for free as an open-source project with a hope to become an industry standard. Although the film is based on the Joyce's book series, it contains differences from the books. The book series, begun in 2011, explains the origins of the characters, while the film takes place about 300 years after the books, and shows how the characters function in present time. Joyce explained, "Because I don't want people to read the book and then go see the movie and go, 'Oh, I like the book better,' and I also didn't want them to know what happens in the movie. And I also knew that during the progress of film production, a lot of things can change. So I wanted to have a sort of distance, so we were able to invoke the books and use them to help us figure out the world of the movie, but I didn't want them to be openly competitive to each other." The idea for the Guardians came from Joyce's daughter, who asked him "if he thought Santa Claus had ever met the Easter Bunny." The film includes a dedication to her, as well a song, "Still Dream," sung over the end credits. Originally, the film was set to be released on November 2, 2012, but DreamWorks Animation pushed the film to November 21, 2012 to avoid competition with Pixar's upcoming film Monsters University, which in turn had been pushed to November 2, 2012 to avoid competition with The Twilight Saga: Breaking Dawn – Part 2. Monsters University was then pushed to June 21, 2013, with Disney's Wreck-It Ralph taking its place. French composer Alexandre Desplat composed the original music for the film, which was released on November 13, 2012 by Varèse Sarabande. The score was recorded in London at Abbey Road Studios and Air Studios, and performed by the London Symphony Orchestra, with a choral contribution by London Voices. David Lindsay-Abaire wrote the lyrics for the end-credit song, "Still Dream," which was performed by soprano Renée Fleming. Stravinsky's Firebird Suite can also be heard during the scene where North first appears. This film marks the first time that a DreamWorks Animation film has not been composed by Hans Zimmer or a member of his Remote Control Productions family of composers (mainly John Powell, Henry Jackman, Harry Gregson-Williams or his brother Rupert Gregson-Williams). Rise of the Guardians had its premiere on October 10, 2012, at The Mill Valley Film Festival in Mill Valley, California, followed by the international premiere at The International Rome Film Festival on November 13, 2012. Under distribution by Paramount Pictures, the film was released on November 21, 2012, in American theaters. Digitally re-mastered into IMAX 3D, it was shown in limited international and domestic IMAX theaters. It was the second film released in the firm Barco's Auro 11.1 3D audio format, after Red Tails. The film was also shown in Dolby Atmos, a surround sound technology introduced in 2012. Rise of the Guardians was the last DreamWorks Animation film distributed by Paramount, as DreamWorks has signed a five-year distribution deal with 20th Century Fox, which started in 2013 with The Croods. Rise of the Guardians was released on Blu-ray Disc (2D and 3D) and DVD on March 12, 2013. That was the last DreamWorks Animation home media release to be distributed by Paramount Home Entertainment, since 20th Century Fox announced its distribution agreement with DreamWorks Animation a few months before the theatrical release. The film was more successful at home media sales than at the box office, having at the end of the second quarter of 2013 "the highest box office to DVD conversion ratio among major releases." In the first quarter of 2013, it sold 3.2 million home entertainment units worldwide, and in the second quarter 0.9 million units, for a total of 4.1 million units. As of August 2013, 2 million DVDs were sold domestically. It was re-released on DVD on November 5, 2013 and comes with a wind-up marching elf toy. It was re-released on DVD and Blu-ray on June 5, 2018 by Universal Pictures Home Entertainment. Based on 148 reviews, the film holds a rating of 74% on review aggregator Rotten Tomatoes, with an average rating of 6.5/10, based on 151 reviews. The website's critical consensus reads: "A sort of Avengers for the elementary school set, Rise of the Guardians is wonderfully animated and briskly paced, but it's only so-so in the storytelling department." Another review aggregator, Metacritic, which assigns a rating out of 100 top reviews from mainstream critics, calculated a score of 57 based on 34 reviews, or "Mixed or average." The film earned an "A" from audiences polled by CinemaScore. Carrie Rickey of The Philadelphia Inquirer gave the film three-and-a-half out of four stars and found the film's characters to have "a primal familiarity, as though they were developed by a tag team of Maurice Sendak and Walt Disney." Olly Richards of Empire wrote, "It's gorgeously designed, deftly written and frequently laugh-out-loud funny. For child or adult, this is a fantasy to get lost in." The Washington Post's Michael O'Sullivan also gave the film a positive review and said, "Thoughts become things. That's the message of Rise of the Guardians, a charming if slightly dark and cobwebbed animated feature about how believing in something makes it real, or real enough." Roger Ebert of the Chicago Sun-Times gave the film three stars and wrote in his review, "There's an audience for this film. It's not me. I gather younger children will like the breakneck action, the magical ability to fly and the young hero who has tired of only being a name." Though he did say, "Their parents and older siblings may find the 89-minute running time quite long enough." Todd McCarthy of The Hollywood Reporter called the film "a lively but derivative 3D storybook spree for some unlikely action heroes." Conversely, Justin Chang in Variety said, "Even tots may emerge feeling slightly browbeaten by this colorful, strenuous and hyperactive fantasy, which has moments of charm and beauty but often resembles an exploding toy factory rather than a work of honest enchantment." Joe Morgenstern of The Wall Street Journal found that the film "lacks a resonant center," and that the script, "seems to have been written by committee, with members lobbying for each major character, and the action, set in vast environments all over the map, spreads itself so thin that a surfeit of motion vitiates emotion." Rise of the Guardians grossed $103.4 million in North America, and $203.5 million in other countries, for a worldwide total of $306.9 million. In North America, the film opened to $32.3 million over its extended five-day weekend, and with $23.8 million over the three-day weekend, it reached fourth place behind The Twilight Saga: Breaking Dawn – Part 2, Skyfall, and Lincoln. The film's opening was the lowest debut for a DreamWorks Animation film since Flushed Away. While the film did gross more than double of its $145 million budget, it still did not turn a profit for DreamWorks Animation due to its high production and marketing costs, forcing the studio to take an $83 million write-down. This marked the first time that the studio had lost money on an animated film since Sinbad: Legend of the Seven Seas. As a result of this combined with other factors, in February 2013, the studio announced it was laying off 350 employees as part of a company-wide restructuring. The Rome Film Festival and Vanity Fair magazine awarded the new Vanity Fair International Award for Cinematic Excellence in November 2012 to Rise of the Guardians. The film also received the Hollywood Animation Award at the 16th Annual Hollywood Film Festival, held on October 22, 2012. A video game based on the film was released by D3 Publisher on November 20, 2012 in North America, and released on November 23, 2012 in Europe. It allows gamers to lead the Guardians in their battle against Pitch. The game is a 3D beat-em-up, where the player travels through each of the worlds: Burgess, North Pole, Bunnymund Valley, Tooth Palace, and Sandman's Ship, to fight Pitch's army of Nightmares. The player can switch between all five guardians at any time, and freely customize their powers, and they learn new special abilities as they level up. All the game versions support up to 4-player gameplay. It is available on the Wii, Wii U, Xbox 360, PlayStation 3, Nintendo DS, and Nintendo 3DS. After the release of the film, the creators of Rise of the Guardians expressed hope that the strong A− Cinemascore average for the film and an enthusiastic word-of-mouth would gather support for the "chance to make a sequel or two." Author and co-producer of the series, William Joyce, also mentioned in March 2013 that he was still in talks about a sequel with DreamWorks Animation: "There is something that we are proposing that we hope they will want to do." ^ In July 2014, the film's distribution rights were purchased by DreamWorks Animation from Paramount Pictures and transferred to 20th Century Fox. The rights were moved to Universal Pictures in 2018 after the buyout of DreamWorks Animation by Comcast/NBCUniversal. ^ a b Grady, Pam (September 23, 2012). "Mill Valley Film Fest: stars, new powers". San Francisco Chronicle. Retrieved October 2, 2012. ^ a b c McCarthy, Todd (October 11, 2012). "Rise of the Guardians: Film Review". The Hollywood Reporter. Retrieved October 12, 2012. ^ Lieberman, David (May 2, 2012). "UPDATE: DreamWorks Animation Will Have Distribution Plan By Labor Day". Deadline Hollywood. Retrieved May 3, 2012. ^ a b "Rise of the Guardians (2012)". Box Office Mojo. Archived from the original on October 9, 2014. Retrieved October 1, 2014. ^ Globe, Golden (13 December 2012). "Golden Globes 2013: full list of nominations". guardian.co.uk. Retrieved January 3, 2013. ^ a b c Finke, Nikki (August 20, 2012). "DreamWorks Animation To Fox For New 5-Year Distribution Deal; UPDATE: Paying Fees Of 8% Theatrical And 6% Digital". Deadline.com. Retrieved August 21, 2012. ^ a b c d e f "DreamWorks Animation Names All-Star Cast Featuring Chris Pine, Alec Baldwin, Hugh Jackman, Isla Fisher and Jude Law for Rise of the Guardians on November 21, 2012". DreamWorksAnimation.com (Press release). January 27, 2011. Archived from the original on January 14, 2013. Retrieved January 28, 2011. ^ "Rise of the Guardians – Yetis". DreamWorks Animation Rise of the Guardians official Facebook page. October 17, 2012. Retrieved October 18, 2012. Natives of the North Pole, Yetis are the blue-collar workers in North's toy factory. Not only did they build the Ice Castle and workshop for North, the Yetis would also do anything for him and serve him loyally. ^ Tooth (June 13, 2012). "You remembered to floss, right?". DreamWorks Animation Rise of the Guardians official Facebook page. Retrieved October 29, 2012. ^ "Did you know Sandman is the oldest of the Guardians?". DreamWorks Animation Rise of the Guardians official Facebook page. October 11, 2012. Retrieved October 18, 2012. ^ Sandman (September 6, 2012). "Sandman was the first Guardian chosen by the Man in the Moon". DreamWorks Animation Rise of the Guardians official Facebook page. Retrieved October 18, 2012. ^ "Although he doesn't speak, he communicates through sand images that he conjures above his head..." DreamWorks Animation Rise of the Guardians official Facebook page. June 13, 2012. Retrieved October 18, 2012. ^ "Up-and-coming child actor Dakota Goyo will voice a character in DWAnimation's RiseOfTheGuardians!". DreamWorks Animation verified Twitter page. February 17, 2011. Retrieved February 25, 2011. ^ "AIMESWORTH AMUSEMENTS, LTD". Business Profiles. Retrieved October 12, 2012. ^ Daly, Helen (June 1, 2005). "Hot House: Reel FX Creative Studios Ramps Up for Animated Fare". Studio Daily. Retrieved October 12, 2012. ^ a b Connelly, Brendon (April 23, 2009). "Dreamworks Teaming Up With William Joyce For The Guardians of Childhood". /Film. Retrieved October 12, 2012. ^ a b c Jardine, William (July 29, 2012). "Interview: William Joyce, Moonbot Studios Co-Founder and Co-Director of Morris Lessmore". A113 Animation. Retrieved July 30, 2012. I was [co-director] ... and then there was a tragic thing, my daughter became ill in post-production, and we lost her, so I had to bow out of directing at that point. ^ a b c Feinberg, Scott (October 15, 2012). "'Rise of the Guardians' Unveiled, Rises to Top Tier of Animated Contenders (Analysis)". The Hollywood Reporter. Retrieved October 17, 2012. ^ Fleming, Michael (November 2, 2009). "DreamWorks sets scribe for 'Guardians'". Variety. Retrieved September 1, 2011. ^ Tulich, Katherine (July 21, 2012). "'Rise of the Guardians' director a self-taught success". Glendale News-Press. Glendale, California. Retrieved September 18, 2012. ^ a b Weintraub, Steve (August 3, 2012). "Guillermo del Toro Talks 'Rise of the Guardians' and 'Pinocchio'; Hopes to Begin Voice Recording in Jan 2013 and Ron Perlman Will Play Stromboli". Collider.com. Retrieved October 17, 2012. ^ "Guillermo del Toro on his experience as executive producer of Rise of the Guardians". In The Works (DreamWorks Animation official blog). October 10, 2012. Retrieved October 17, 2012. ^ Weintraub, Steve (November 20, 2012). "Director Peter Ramsey Talks RISE OF THE GUARDIANS, Roger Deakins, HOW TO TRAIN YOUR DRAGON 2, Working with David Fincher on FIGHT CLUB, and More". Collider.com. Retrieved November 22, 2012. ^ Orden, Erica (November 20, 2012). "DreamWorks Releases Software Used in 'Guardians'". The Wall Street Journal. Retrieved November 22, 2012. ^ "DreamWorks Animation Releases Proprietary Volumetric Format OpenVDB to Open Source Community". DreamWorks Animation. August 3, 2012. Archived from the original on January 21, 2013. Retrieved November 22, 2012. ^ Hammond, Pete (November 5, 2012). "AFI Fest: 'Rise Of The Guardians' Tries To Stake Its Claim In Oscar Race And At Holiday Box Office". Deadline Hollywood. Retrieved November 6, 2012. ^ a b Subers, Ray (August 4, 2010). "Disney Shifts 'Monsters Inc. 2,' Drops Two Others". Box Office Mojo. Archived from the original on October 6, 2013. Retrieved December 9, 2010. ^ "Disney Changes Dates For 'Monsters University', 'Reboot Ralph'". Deadline Hollywood. April 4, 2011. Retrieved July 10, 2011. ^ "Famed Soprano Renee Fleming Performs Original Single "Still Dream" With Music By Alexandre Desplat and Lyrics By David Lindsay-Abaire for DreamWorks Animation's 'Rise of the Guardians'" (Press release). DreamWorks Animation. October 15, 2012. Archived from the original on January 22, 2013. Retrieved October 17, 2012. ^ "Rise of the Guardians". Varèse Sarabande. Archived from the original on December 28, 2012. Retrieved October 20, 2012. ^ a b J. Lyman, Eric (October 2, 2012). "'Rise of the Guardians' to Receive New 'Vanity Fair' Honor at Upcoming Rome Fest". The Hollywood Reporter. Retrieved October 2, 2012. ^ "7 Festival Internazionale del Film di Roma - Guide e Programma" (PDF). Roma Cinema Fest. p. 5. Retrieved November 6, 2012. ^ Finke, Nikki (November 1, 2012). "'Rise Of The Guardians' To Play IMAX Nov. 21". Deadline.com. Retrieved November 1, 2012. ^ "Barco Auro 11.1 3D sound technology will be featured in global release of DreamWorks Animation's 'Rise of the Guardians'" (Press release). Barco. October 5, 2012. Retrieved October 10, 2012. ^ Giardina, Carolyn (October 31, 2012). "'Rise of the Guardians,' 'Gravity,' 'Pacific Rim' Will Be Mixed in Dolby Atmos". The Hollywood Reporter. Retrieved October 31, 2012. ^ "Rise of the Guardians Blu-ray 3D Release Date, Details and Pre-Order". The HD Room. January 19, 2013. Retrieved January 21, 2013. ^ "DreamWorks Animation Reports First Quarter 2013 Financial Results". DreamWorks Animation. April 30, 2013. Archived from the original on August 3, 2013. Retrieved August 3, 2013. ^ "DreamWorks Animation Reports Second Quarter 2013 Financial Results". DreamWorks Animation. July 31, 2013. Archived from the original on August 3, 2013. Retrieved August 3, 2013. ^ "Rise of the Guardians - DVD Sales". The Numbers. Retrieved August 3, 2013. ^ "Rise of the Guardians (2012)". Rotten Tomatoes. Fandango Media. Retrieved June 18, 2018. ^ "Rise of the Guardians Reviews". Metacritic. CBS Interactive. Retrieved March 5, 2018. ^ a b Subers, Ray (November 25, 2012). "Weekend Report: 'Twilight,' Bond Dominate Fruitful Thanksgiving". Box Office Mojo. Archived from the original on October 7, 2014. Retrieved November 26, 2012. ^ Chang, Justin (October 11, 2012). "Rise of the Guardians". Variety. Retrieved October 18, 2012. ^ a b Child, Ben (February 27, 2013). "DreamWorks Animation facing jobs cuts after Rise of the Guardians tanks". The Guardian. Retrieved February 27, 2013. ^ a b Shaw, Lucas (February 27, 2013). "DreamWorks Animation to Lay Off 350 Employees". The Wrap. Retrieved February 26, 2013. The Glendale, Calif.-based company posted a loss of $83 million in the fourth quarter of fiscal year 2012 due to development costs and the poor performance of its latest film, Rise of the Guardians. ^ a b Feinberg, Scott (September 4, 2012). "'Rise of the Guardians' to Receive Animation Prize at 16th Hollywood Film Awards (Exclusive)". The Hollywood Reporter. Retrieved October 6, 2012. ^ Kay, Jeremy (October 15, 2012). "Life Of Pi wins 35th Mill Valley Film Festival audience award". Screen Daily. Retrieved October 18, 2012. ^ Tapley, Kristopher (December 22, 2012). "'Zero Dark Thirty' fares well with Women Film Critics Circle". HitFix. Retrieved December 31, 2012. ^ Marchiafava, Jeff (June 7, 2012). "Rise of the Guardians". Game Informer. Retrieved November 8, 2012. ^ "D3Publisher reveals product details for 'Rise of the Guardians: The Video Game'". Bandai Namco. July 16, 2012. Retrieved July 16, 2012. ^ "D3Publisher and DreamWorks Animation Announce Multi-Property Agreement for Next Three Animated Feature Films" (Press release). DreamWorks Animation. February 7, 2012. Archived from the original on July 13, 2012. Retrieved February 7, 2012. ^ "E3 2012 : Rise of the Guardians annoncé". JeuxVideo.com. June 6, 2012. Retrieved June 9, 2012. 'Les versions PS3, Xbox 360, Wii, DS et 3DS sont attendues pour cet automne, et la déclinaison Wii U est déjà confirmée. / The PS3, Xbox 360, Wii, DS and 3DS are expected this autumn and the ... Wii U is already confirmed. ^ Willman, Chris (November 29, 2012). "'Rise of Guardians' Filmmakers Hoping to Make Sword-Wielding-Santa Sequels". The Wrap. Retrieved April 20, 2013. ^ Philbrick, Jami (March 11, 2013). "IAR EXCLUSIVE INTERVIEW: AUTHOR/ILLUSTRATOR WILLIAM JOYCE TALKS 'RISE OF THE GUARDIANS' BLU-RAY/DVD, AND A POSSIBLE SEQUEL". iamROGUE.COM. Retrieved April 20, 2013. 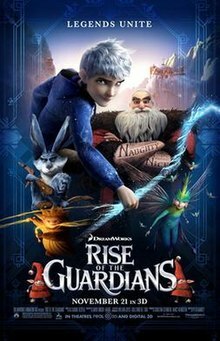 Wikimedia Commons has media related to Rise of the Guardians. DreamWorks Animation LLC is an American animation studio that is a subsidiary of Universal Pictures, a division of Comcast through its wholly owned subsidiary NBCUniversal. It is based in Glendale, California and produces animated feature films, television programs and online virtual games. The studio has currently released a total of 36 feature films, including ones from the Shrek, Madagascar, Kung Fu Panda, How to Train Your Dragon, The Croods, Trolls and The Boss Baby franchises. Christopher Michael Sanders is an American animation director, film director, screenwriter, producer, illustrator and voice actor. He is best known for co-writing and directing Disney's Lilo & Stitch (2002) and DreamWorks' How to Train Your Dragon (2010), both of which he co-wrote and co-directed with Dean DeBlois, and for creating and voicing Stitch in Lilo & Stitch and every Western-produced work in its franchise. He also served as director and co-writer on The Croods, along with Kirk DeMicco. Robert Ralph Minkoff is an American filmmaker. He is known for directing the Academy Award–winning animated feature The Lion King, along with directing Stuart Little, Stuart Little 2, The Haunted Mansion, and Mr. Peabody & Sherman. William Edward Joyce is an American writer, illustrator, and filmmaker. His illustrations have appeared on numerous covers of The New Yorker and his paintings are displayed nationwide. For the short film The Fantastic Flying Books of Mr. Morris Lessmore (2011), Joyce won the Academy Award for Best Animated Short Film at the 84th Academy Awards. Peter A. Ramsey is an American film director, illustrator, and writer. He is best known for directing DreamWorks Animation's Rise of the Guardians (2012) and Sony Pictures Animation's Spider-Man: Into the Spider-Verse (2018), the latter of which he co-directed alongside Bob Persichetti and Rodney Rothman. How to Train Your Dragon 2 is a 2014 American computer-animated action fantasy film loosely based on the book series of the same name by Cressida Cowell, produced by DreamWorks Animation and distributed by 20th Century Fox. It is the sequel to the 2010 computer-animated film How to Train Your Dragon and the second installment in the trilogy. The film is written and directed by Dean DeBlois, and stars the voices of Jay Baruchel, Gerard Butler, Craig Ferguson, America Ferrera, Jonah Hill, Christopher Mintz-Plasse, T. J. Miller, and Kristen Wiig, along with Cate Blanchett, Djimon Hounsou, and Kit Harington joining the cast. The film takes place five years after the first film, featuring Hiccup and his friends as young adults as they meet Valka, Hiccup's long-lost mother, and Drago Bludvist, a madman who wants to conquer the world. Paramount Animation is the animation division and label of Paramount Pictures. The division was founded on July 6, 2011 in response to the success of Rango and DreamWorks Animation's departure from Paramount in 2012. Its first animated film The SpongeBob Movie: Sponge Out of Water was released on February 6, 2015, and its latest release Wonder Park was released on March 15, 2019 with its next release being Sonic the Hedgehog on November 8, 2019. Turbo is a 2013 American computer-animated sports comedy film produced by DreamWorks Animation and distributed by 20th Century Fox. It is based on an original idea by David Soren, who also directed the film in his feature debut. Set in Indianapolis, the film features an ordinary garden snail named Turbo whose dream of becoming the world's fastest snail comes true. The film was released on July 17, 2013. The film stars the voices of Ryan Reynolds, Paul Giamatti, Michael Peña, Snoop Dogg, Maya Rudolph, Michelle Rodriguez and Samuel L. Jackson. Home is a 2015 American 3D animated science fiction comedy film produced by DreamWorks Animation and distributed by 20th Century Fox. It is loosely based on Adam Rex's 2007 children's book The True Meaning of Smekday and stars the voices of Jim Parsons, Rihanna, Steve Martin, Jennifer Lopez, and Matt Jones. Tim Johnson is the director of the film, Chris Jenkins and Suzanne Buirgy are its producers, and the screenplay is by Tom J. Astle and Matt Ember. The story takes place on planet Earth, where an alien race called the Boov invade the planet. However, a feisty human girl named Tip Tucci manages to avoid capture, and goes on the run with Oh, a fugitive Boov and together, the two form an unlikely friendship whilst searching for Tip’s mother and avoiding capture from the Boov. Trolls is a 2016 American computer-animated musical comedy film based on the Troll dolls created by Thomas Dam. The film was directed by Mike Mitchell and co-directed by Walt Dohrn, written by Jonathan Aibel and Glenn Berger and based on a story by Erica Rivinoja. The film features the voices of Anna Kendrick, Justin Timberlake, Christopher Mintz-Plasse, Zooey Deschanel, Christine Baranski, Russell Brand, James Corden and Gwen Stefani. The film follows two trolls who go on a quest, to save their village from destruction by the Bergens, creatures who eat Trolls to be happy.